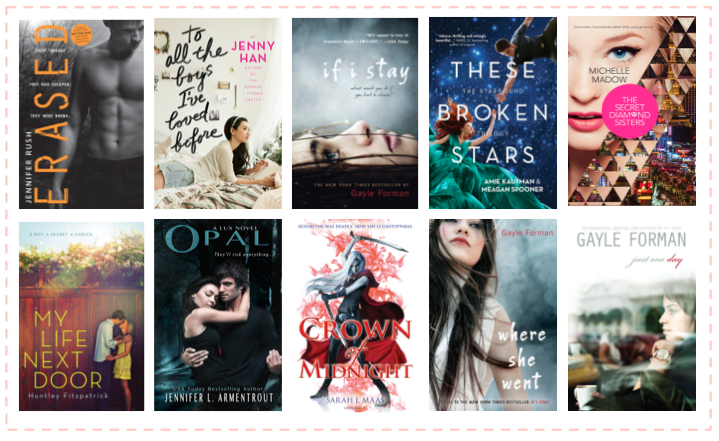 The Girly Geek: April Wrap Up! April was a really good reading month for me! I read a total of 10 books! Almost all of which were fantastic. I wanted to make the most out of my break and spend it with amazing books so I specifically chose what to read based on reviews and recommendations from friends. I also re-read a few of my favourites. I absolutely loved the books I read this month, All except one book received over four stars from me! That's pretty darn good. I'm a bit behind on my reviews on these books because I really just wanted to spend my break relaxing and spending time with my family, so I apologise for that, but the reviews will be posted very soon! This book was absolutely amazing. It was a very rare and perfect mix of sci-fi and action mixed with a very genuine romance. Review to come! I thought Throne of Glass was incredible and this book was just so much more exciting. It was so full of surprises and unexpected plot twists, I'm completely obsessed. Review to come! I had really high hopes for this novel after reading the synopsis, but I was very disappointed with it. It had a lot of potential and an excellent premise only I felt that it was very poorly executed. Read my review here. I started reading the Lux Series late last year and have been obsessed with it ever since. I finally got a chance to read Opal, which is the third book in the series. This book was just as good as the first two, and just as action-packed. BUT THAT ENDING! The cliffhanger at the end killed me and I will definitely be reading the next book in May. Review to come! I read Jenny Han's The Summer I Turned Pretty series a few years ago and it is still one of my favourite contemporary series to this date. There is just something about Jenny Han's writing that is so genuine and wonderful. I waited for this book forever, and after hearing the premise I knew it was going to be incredible. I was not disappointed. To All the Boy's I've loved before is a very genuine and unique story that I absolutely adored. Review to come! This book is easily one of my favourite contemporaries. It is such a realistic and genuine story about a teenage girl that faces some really true to teenage life issues and is adorably sweet without being overly sappy. There was a massive plot twist in this book that didn't feel too manipulative or unnecessary, it was the perfect twist and added so much more meaning and reality to the story. Review to come! This is the second book in the Altered series, I read the first book last year and really enjoyed it. Erased was such a good sequel, and I felt that it was just as action packed and thrilling as the first but with alot more answers and character development. I can't wait for the sequel to come out! Review to come! Gayle Forman is one of my favourite authors. There is something so genuine and beautifully authentic about her novels that I have found I can relate to in many ways. When I saw the trailer for the If I Stay movie I was so overly emotional and was filled with an incessant need to relive the story, so I did. I re-read both If I Stay, and the sequel Where She Went. I'll be posting reviews on both very soon! Of course after re-reading If I Stay and Where She Went, I needed more Gayle Forman. So I decided to re-read Just One Day. It was just as good the second time around and I was just overcome with emotions. This book just means so much to me. I am currently reading the second book Just One Year. ALSO, yesterday, Gayle announced that she will be releasing a novella to this series called Just One Night on May 29th! I was literally so excited to the point that I was shaking and completely incoherent. I can't wait to find out more about Allyson's story. I NEED THIS NOVELLA NOW.